Although this vessel came loaded with some serious equipment from the very start, we kept adding more and more…or should I say, we are still adding on, it seems to never end! There’s a number of improvements that can make life at sea so much more comfortable. And so came the big, powerful Watermaker. And the Single SideBand radio. And the Solar Panels. And the Spinnaker. And the new Batteries. And more electronics than N.A.S.A. WHEW! I won’t bore you further with the list of stuff, that’s for the insurance company… Suffice to say, this is one cozy, sturdy little yacht. There’s also another side to all this prepping: the crew needs to prepare somewhat, too! We’ve both taken (and passed!) the General Ham Radio test. Lori is trying to organize storage and find more space where there is none, also slowly compiling a list of spares for everything. It’s mind-blowing to even try to think of everything, so to keep our already scarce and questionable mental sanity we decided to just do the best we can, and face further challenges and situations as they happen. 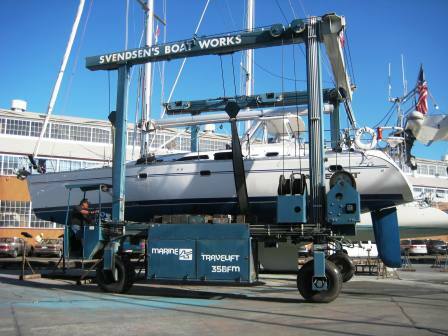 May 04, 2010 Haulout – Camelot was hauled at Svendsen’s Boatworks in Alameda to apply a new coat of bottom paint. 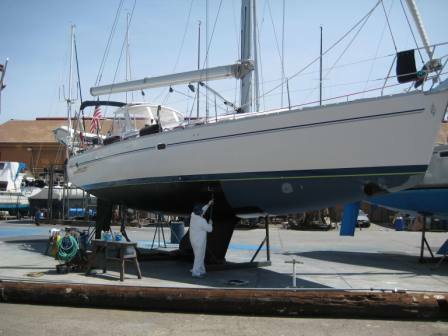 Camelot getting her new bottom paint.